In a project spearheaded by investigators at UC San Francisco, scientists have devised a new strategy to precisely modify human T cells using the genome-editing system known as CRISPR/Cas9. Because these immune-system cells play important roles in a wide range of diseases, from diabetes to AIDS to cancer, the achievement provides a versatile new tool for research on T cell function, as well as a path toward CRISPR/Cas9-based therapies for many serious health problems. Using their novel approach, the scientists were able to disable a protein on the T-cell surface called CXCR4, which can be exploited by HIV when the virus infects T cells and causes AIDS. The group also successfully shut down PD-1, a protein that has attracted intense interest in the burgeoning field of cancer immunotherapy, as scientists have shown that using drugs to block PD-1 coaxes T cells to attack tumors. The CRISPR/Cas9 system has captured the imagination of both scientists and the general public, because it makes it possible to easily and inexpensively edit genetic information in virtually any organism. T cells, which circulate in the blood, are an obvious candidate for medical applications of the technology, as these cells not only stand at the center of many disease processes, but could be easily gathered from patients, edited with CRISPR/Cas9, then returned to the body to exert therapeutic effects. The new work was done under the auspices of the Innovative Genomics Initiative (IGI), a joint UC Berkeley-UCSF program co-directed by Berkeley’s Jennifer Doudna, PhD, and Jonathan Weissman, PhD, professor of cellular and molecular pharmacology at UCSF and a Howard Hughes Medical Institute (HHMI) investigator. Marson is an affiliate member of the IGI. 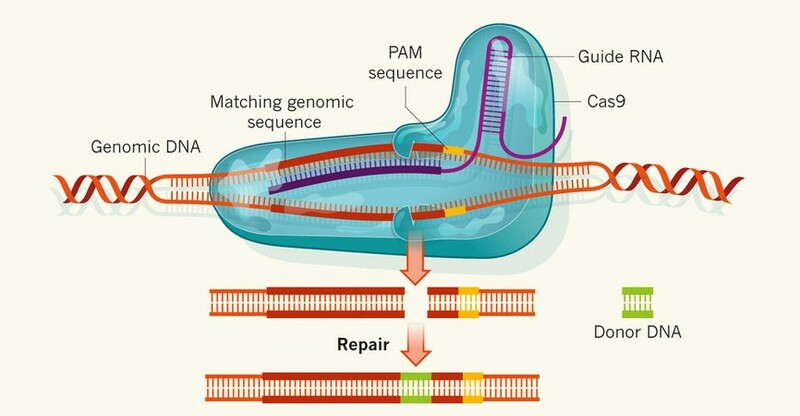 Doudna, professor of chemistry and of cell and molecular biology at Berkeley, and an HHMI investigator, said that the research is a significant step forward in bringing the power of CRISPR/Cas9 editing to human biology and medicine. “It’s been great to be part of this exciting collaboration, and I look forward to seeing the insights from this work used to help patients in the future,” said Doudna, co-corresponding author of the new paper. Cas9, an enzyme in the CRISPR system that makes cuts in DNA and allows new genetic sequences to be inserted, has generally been introduced into cells using viruses or circular bits of DNA called plasmids. Then, in a separate step, a genetic construct known as single-guide RNA, which steers Cas9 to the specific spots in DNA where cuts are desired, is also placed into the cells. Until recently, however, editing human T cells with CRISPR/Cas9 has been inefficient, with only a relatively small percentage of cells being successfully modified. And while scientists have had some success in switching off genes by inserting or deleting random sequences, they have not yet been able to use CRISPR/Cas9 to paste in (or “knock in”) specific new sequences to correct mutations in T cells. As will be reported online in Proceedings of the National Academy of Sciences during the week of July 27, 2015, a team led by first authors Kathrin Schumann, PhD, a postdoctoral fellow in Marson’s laboratory, and Steven Lin, PhD, a postdoctoral fellow in the Doudna lab, cracked these problems by streamlining the delivery of Cas9 and single-guide RNA to cells. In lab dishes, the group assembled Cas9 ribonucleoproteins, or RNPs, which combine the Cas9 protein with single-guide RNA. They then used a method known as electroporation, in which cells are briefly exposed to an electrical field that makes their membranes more permeable, to quickly deliver these RNPs to the interior of the cells. With these innovations, the researchers successfully edited CXCR4 and PD-1, even knocking in new sequences to replace specific genetic “letters” in these proteins. The group was then able to sort the cells using markers expressed on the cell surface, to help pull out successfully edited cells for research, and eventually for therapeutic use. Marson stressed that, while recent reports of CRISPR/Cas9 editing of human embryos have stirred up controversy, T cells are created anew in each individual, so modifications would not be passed on to future generations. He hopes that Cas9-based therapies for T cell-related disorders, which include autoimmune diseases as well as immunodeficiencies such as “bubble boy disease,” will enter the clinic in the future. The above post is reprinted from materials provided by University of California – San Francisco. Note: Materials may be edited for content and length.